With the gradual development of rules for designing against instability the idea emerged, in London, in 1974 to hold an International Colloquium treating every aspect of structural instability of steel structures. There have been 17 International Colloquia Stability Sessions around the world, starting with the first one in Paris in 1972, until with the last one in Nagoya in 1997. In Nagoya it was decided to continue the series of travelling colloquia by launching the Sixth Colloquium in September 1999 with the First Session to be held at the "Politehnica" University of Timi&scedil;oara, România, which will be followed by another in the year 2000 at the Gediminas Technical University in Vilnius, Lithuania, a third one during SSRC's Year 2000 Annual Meeting in the US, and a fourth one in Australia or New Zealand. At present important research projects are in progress around the world, like SAC Joint Venture Project in USA, INCO-COPERNICUS "RECOS" in Europe and others, which are devoted to improve and develop new methods for the safety design of steel structures in seismic zones. Special attention is paid in Europe, USA and Japan to improve the design codes and detailing of seismic resistant steel structures. This was the reason to organise the Session of Nagoya as "Stability and Ductility of Steel Structures" Colloquium. Romania is also a strong seismic territory and therefore, the topic of the Timi&scedil;oara Session covered both stability and ductility problems. The technical programme of the SDSS'99 Colloquium in Timi&scedil;oara has been split into nine working sessions. For structural engineers and researchers working in the field of steel structures. Chapter headings and selected papers: Foreword. Basic Problems. Design Concept and Codification of Steel and Composite Steel Concrete Structures. Transition from deterministic to probabilistic structural steel reliability assessment with special attention to stability problems (M. Krejsa, P. Marek). Particularities raised by the evaluation of load reduction factors for the seismic design of composite steel-concrete structures (L. Sanchez, A. Plumier). Stability of Structural Members. Elastic lateral buckling of coped beams (R. Abspoel, J. Stark). Validation of design rules for member stability of European Standards - proposal for buckling rules (R. Greiner, R. Ofner). Stability of Plates and Plated Structures. Towards a better knowledge about the web breathing phenomenon (Y. Duchêne et al.). Reduction of ultimate strength of girders due to stiffener-end-gaps (I. Okura et al.). Connections. Behaviour of beam-to-column joints in moment-resisting steel frames (C. Bernuzzi et al.). Remarks on the use of EC3-Annex J for the prediction of aluminium joint behaviour (G. De Matteis et al.). Local Ductility. Factors influencing ductility in high performance steel I-shaped beams (C.J. Earls). Ductility of plate girder panels under cyclic shear (Y. Fukumoto et al.). Framed Structures: Global Performances. Static and Stability Behaviour. An advanced analysis for steel frame design: comparison with test results (A.M. Barszcz, M.A. Gizejowski). The spatial behaviour of the scaffold used for the coal conveyance (A. Ivan et al.). Ductility and Seismic Response. Global performance of steel moment resisting frames with semi-rigid joints (D. Dubina et al.). A global approach to the design of steel frames (A. Ghersi et al.). Cold Formed Steel Members and Structures. Experimental verification of light structure (Z. Agócs). Elastic stability of built-up columns using the spline finite strip method (M. Djafour et al.). Stability and Dynamic of Shells. Supporting towers for medium power wind turbines (A. Botici, T. Let). Behaviour of cylindrical steel shell subjected to silo loads (A. Khelil et al.). 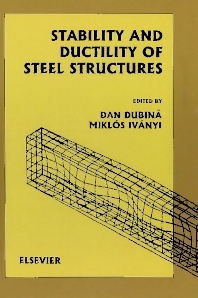 Stability and Ductility Problems in Steel Bridges Structures. Appraisal of existing steel bridges using modern methods (R. B&acaron;ncil&acaron; et al.). Combined action of monoaxial bending and axial compression in the view of new Eurocode 3-Part 2: Steel Bridges (H. Šertler). Author index. Keyword index.